Answers to the Confederate parks controversy aren't inscribed in black and white. On most Saturday afternoons in the summer, not much happens at Forrest Park. By August, the grass is dried up, and the pin oaks are lethargic. The crepe myrtles nod a little, but only when there's a breeze. 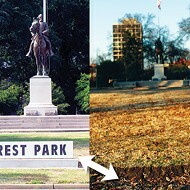 In the center of the park, separated from the shade trees, is a bronze statue on a marble base: Nathan Bedford Forrest, Confederate general and first grand wizard of the Ku Klux Klan, sits mounted on his horse, looking south. He is still and massive, oblivious to the traffic on Union Avenue or the controversy that makes Margaret Tull and her family stop by to pay their respects before heading home to Selmer, Tennessee. The group, five in all, walks quickly through the park, scattering the quiet with their energy and purpose. They don't seem to notice the man sacked out near the exercise trail, or that Forrest's wife, Mary, is buried beneath the statue too. Instead, they are intent on remembering the general and, for those who will listen, setting the record straight. "We think he was a great man," says Katalin, Tull's 15-year-old daughter. She leads her three cousins up the monument steps, where they link arms and smile big for the camera. "Wait, let me get another one," her mother calls out, clicking away. "General Forrest might be gone next time we get to Memphis." No matter how you feel about the proposals to rename Forrest Park or to move the couple's remains to Elmwood Cemetery or to just hand over the park's care to the University of Tennessee, there's something kind of nice about stair-step cousins traveling 80 miles to Memphis to learn more about local history. "I wanted them to see Baptist Hospital because I went to nursing school there, and I wanted them to see Forrest Park," Tull explains. "I'm a good Southern girl who was raised to admire the generals of the South." When I hear her explanation, I check out for a few minutes because by now some of these justifications are sounding, well, a little parochial: You can't change history. We need the Confederate monuments so we don't make the same mistakes. The Civil War caused such deep wounds that we're still fighting about it 140 years later. But then, unexpectedly, Tull cuts through the rhetoric and pulls me back in. "I'm not black, so I can't speak to how a black person would feel about a Confederate monument," Tull says. "But I do believe this: Individuals study history from their own perspective. That's why the controversy over renaming the park isn't so much about black or white. It's about where the history hits you in the heart." Her words seem profound, particularly in a city where heartfelt reactions to history, be it Civil War or civil rights, typically fall along racial lines. So is it race that makes changing the Confederate parks feel more like a complex social issue than a simple naming debate? Or is the community upheaval over Confederate monuments just creative problem-solving by a city finally trying to sidestep racial divides? In many ways, the summertime debate over the Confederate parks has been a perfect storm of politics and timing by, at times, disparate groups. A month ago, the Sons of Confederate Veterans hosted a centennial at Forrest Park to remember Forrest's 184th birthday and the 100th anniversary of his statue's dedication. Civil War re-enactors brought tents, cannons, and historic photographs to the celebration, but a performance by Snowflake's Minstrels, a troupe of white actors who paint their faces black, was canceled. Less than two weeks later, the Center City Commission, a 20-member group that promotes the redevelopment of downtown Memphis, asked the City Council to consider renaming the Confederate parks. The proposal, spearheaded by county commissioner Walter Bailey, included Forrest Park, located in the middle of the University of Tennessee medical complex; Jefferson Davis Park, located along Riverside Drive near the city's official Welcome Center; and Confederate Park on Front Street, located not far from City Hall. Karl Schledwitz, a local attorney and University of Tennessee trustee, weighed in next. He submitted a proposal to move Forrest's remains to historic Elmwood Cemetery, where he was originally buried in 1877. Protests by some Memphians started almost immediately. A group called Save Our Parks staged a rally near the Forrest monument at evening rush hour. While some protesters waved signs at passing traffic, others used their own lawn equipment to cut the park's overgrown grass. The Sons of Confederate Veterans objected as well, writing letters to local media and pledging $10,000 to fight name-change proposals. Fueling the debate even more was inviting the Rev. Al Sharpton, social activist from New York City and former presidential candidate, to lead last Saturday's Rally for Dignity sponsored by the Memphis Rainbow PUSH Coalition. Sharpton's invitation from the Rev. L. LaSimba Gray angered many people, both black and white, including Mayor Willie Herenton who held a news conference to denounce "outside agitators" and to release his own recommendations: Don't rename the parks, but convey ownership of the land to the University of Tennessee and the Riverfront Development Corporation. A week or so later, Herenton revised his recommendations, saying the city should maintain park ownership but relinquish maintenance agreements. He also announced his intention to seek a fifth term as mayor. Herenton's new recommendations were scheduled on the parks committee agenda this week, and organizers at the Sharpton rally urged participants to show up at Tuesday's council meeting to protest and submit petitions. About 250 people attended the rally, gathering around the Forrest statue to hear Sharpton proclaim: "We need to show the rest of the world that the day for honoring people like this is over." An impressive orator, Sharpton was at his best, urging Memphis to start a national campaign to eliminate all symbols and monuments that offend African Americans. In typical style, he also confronted his critics head-on: "You need outside agitators when you don't have enough inside agitators. Don't get mad at us for doing your job." All morning, police patrolled Forrest Park and Confederate Park, where a small group of counter-protesters honored Confederate history. Both parks were cordoned off with police tape, channeling people through bag checks with hand-held metal detectors. But at Jefferson Davis Park, activity was uneventful. The green space along the Mississippi was quiet and almost empty, except for a fabricated sign with red letters reading, "Louis Farrakhan Park: Now are you happy?" Scout Morris, one of about two-dozen white people listening to Sharpton, could be the only non-media person in Memphis to attend both the Sharpton rally and the Forrest centennial held a month before. He says different reasons made him a little uncomfortable at both events. "I felt uncomfortable at the centennial celebration because I was on record as supporting the name change," says Morris who is a member of the Center City Commission and an attorney with the firm Martin, Tate, Morrow & Marston. "At the Sharpton rally, I felt like a few people were looking at me suspiciously wondering what side I'm on. Unfortunately, for most of the people going to these rallies, there is not a lot of understanding or respect for the contrary point of view." Generally, Morris says he supports the views expressed at the Sharpton rally, particularly the idea that there's nothing wrong with addressing issues that aren't paramount. "People like to talk about renaming the parks," he says, "but it doesn't mean they are forgetting about other issues that matter more. You can discuss some things without ignoring others." A biography of Forrest by Tennessee author Jack Hurst provides a more comprehensive explanation of an intelligent but ruthless man. A review of Hurst's book appeared last year in the Intelligence Report, a quarterly magazine from the Southern Poverty Law Center in Montgomery, Alabama. Copies of the review were left last week at the base of the Forrest statue, stacked neatly inside a manila envelope. Contacted at his home in Lancaster, Hurst was unaware of the park controversy in Memphis, but he wasn't at all surprised. "The fact that Nathan Bedford Forrest was a leader of the Ku Klux Klan and a slave trader before the Civil War naturally makes him a lightning rod," Hurst says. A career newspaperman, Hurst, who is 64, says he is still deeply conflicted on Forrest's place in history. "He was tremendously driven, a brilliant military tactician, a guy who came from the backwoods with no advantages and only six months of formal education," Hurst says. "But then Abraham Lincoln only had a year of formal education, and no words are horrible enough to describe slavery. To understand Forrest, we should try to understand the time he lived in, but his time certainly doesn't fit with our way of life today." Generational change makes a statement in the Rev. Ray Allen, a retired Methodist minister and former dean of admissions at Rhodes College. Allen, along with 15 other ministers, attended a community prayer summit for racial harmony last week at Christ United Methodist Church. Like the ministers before him, Allen stepped to the microphone to deliver his prayer, dignified and earnest. But first, he had something else to say: "My mother, Louise Martin Allen, raised the money for the statue of Jefferson Davis now in Confederate Park. I honor her memory for the work she did, but I certainly don't have the same feelings about segregation and the Confederacy that prevailed at the time." "I think many problems are better served by compromise, cooperation, and looking forward, not dwelling on the evils of the past," Allen says later. "Whatever the solution to the park controversy is, I hope it unites us, not divides us." The Rev. Dwight Montgomery, president of the local Southern Christian Leadership Conference chapter, agrees. Montgomery, who organized the prayer summit, is one of many black pastors who say the parks controversy is diverting too much attention from more urgent issues such as Tenn Care and gang violence. Consequently, he's stayed away from the protests, including the Sharpton rally. "Let me make it clear as an African American that I don't appreciate the names of those parks, and I am not criticizing any other organization's methods," Montgomery explains. He says he admires Sharpton and that Gray is a mentor and friend. "But my concern is to eliminate the existence of bigotry by dealing with the issues first. Dealing with the important issues makes the symbols of racism become null and void." Along those lines, Montgomery is forming a Coalition for Racial Harmony and Equality for clergy of all faiths. "I want to see black and white churches all over Memphis exchanging pulpits," he says. "Let's get some national attention for that." He believes most people in Memphis, regardless of race, agree with his perspective. "Throughout this whole debate on the parks, the Southern Christian Leadership Conference has not received one phone call urging us to become involved in the issue, and my home phone number was even put in the paper," Montgomery says. "Our phone calls have been 'My daddy's being cut off of TennCare. Can you help?'" City councilman Myron Lowery has been the most visible council member in the controversy, investing time and energy into meetings and discussion groups. Although there were shouts of "Myron for mayor" at the Sharpton rally, Lowery says he's only interested in helping Memphis become a more cohesive community. Like Montgomery, Lowery sees opinions in the naming debate crisscrossing racial lines. "This is not a black-versus-white issue," he says. "This is a blended issue, but it's getting out of hand. That's why I've decided we should just put it to a referendum and allow everyone to vote." A number of other suggestions are surfacing as well, such as renaming the park Forrest-Grant, adding a monument to Ida B. Wells, and skipping the Civil War altogether in favor of a musical-heritage theme. Many ideas came from a community dialogue organized by Lowery with help from the organization called Facing History and Ourselves. Program associate Steven Becton facilitated the meeting along with Rachel Shankman, director of the group's Memphis office. "People are disagreeing, but the dialogue is not always being categorized by race," Becton says. "The dialogue is also about our legacy, it's about how our history is or is not remembered. When you look at all these things, you realize that maybe we are starting to grapple with issues from multiple perspectives, and that is healthy and very encouraging." Becton admits that as an African American who grew up in Memphis, a part of him wants to change the park names. "But the historian part of me wants to preserve the history as it stands because Nathan Bedford Forrest was a complicated man, and it's the complexities of individuals and the complexities of history that make us learn and grow," Becton continues. "This issue is, when you get down to it, a very teachable moment." Can you explain more about Forrest as a slave trader? Hurst: Forrest's uncle ran a mercantile business in Hernando, Mississippi, and he was dealing some in slaves. When Forrest was about 25 years old, he moved to Hernando to join his uncle in that business. By the time Forrest returned to Memphis, slave-trading was his principal business. At the time, the southwestern United States was really opening up, and plantation owners needed workers. Forrest traveled all over the southwest trading slaves, from Kentucky to Texas. He was one of the major slave traders in the southwest from about 1852 until just before the Civil War started. In fact, he was a major slave trader when he was elected to the Memphis City Council in 1857 or '58, and he served two terms. Did he really make a fortune trading slaves? Forrest had offices all along the Mississippi River. Any time a plantation owner fell on hard times, he would sell his slaves. I know this sounds just reprehensible, but by the time of the Civil War, slaves could sell for more than $1,000 a piece. Forrest claimed he was worth more than $1 million, and that was probably true. Some people try to say that he made his money in real estate, because real estate and trading slaves were related businesses. But slaves were more valuable than land, so it's pretty obvious that the money he made in slave trading came first. What about Forrest's reputation as a ruthless military leader? He came to the military from outside military tradition. He wasn't trained in the niceties of combat. To him, it was the bottom line: You either won or lost. There is some evidence that he tried to take care of wounded prisoners after the battles, but when people defied him, he was a ruthless guy. It was, after all, a ruthless time. What exactly was Forrest's role in the Ku Klux Klan? Nothing was ever written down about that, but it was commonly accepted that he was running the Klan from 1867 to 1869. He was the Klan's first grand wizard. He eventually had to testify before Congress about Klan activity, but he tried to sidestep his own involvement. Did Forrest ever change his views toward blacks? I do think that after the Klan, Forrest made some overtures that a lot of people in his place and time did not make. He gave some speeches about needing to welcome northerners instead of demeaning them as carpetbaggers. But you have to remember that he was trying to build a railroad from Memphis to Selma, Alabama, so by 1871 he was keenly aware of the business aspects of trying to create a new image for the South. How did it go with the railroad attempt? Several economic panics during that time really ran up the price of steel. It was a titanic effort, but it ultimately failed and ruined Forrest financially. Are you writing a new book now? possible, as often as necessary." Saturday will definitely go down in Memphis history as the day that the Rev. Al Sharpton came to town in support of an effort to rebury a vintage Confederate hero elsewhere. Those Memphians who welcomed Sharpton - prominently including the Rev. LaSimba Gray and the Bailey brothers, Circuit Court judge D'Army and Shelby County commissioner Walter - want it to go down also as the day the Confederacy itself began to be reburied in the swamp of historical oblivion. Speaking at Forrest Park under the statue of the legendary Confederate military commander whom he persisted in calling "Nathan Bedford Foster," Sharpton called for the removal of the general's grave and statue from the park. Sharpton promised to return "again and again" and to focus attention on Memphis as "a national example" until the entire South is forced to renounce the last vestiges of the Confederacy. Though he declined to mention Memphis mayor Willie Herenton by name, Sharpton heaped scorn on those black leaders who, like Herenton, have distanced themselves from the local effort to remove the Forrest presence from the park and to rename it, as well as Confederate Park and Jefferson Davis Park. Afterward, in his personal trailer, surrounded by a small group of supporters that included Gray and the Baileys, Sharpton munched on peanuts and talked about his current mission. Flyer: Is there a relationship between this current matter and your presidential ambitions? Sharpton: No, not at all. I mean, clearly, I'm not ruling out a presidential race, but I think all national leaders ought to take a position on this. I framed my statements the way I did because we're fighting terrorism. The Confederates were the terrorists of the 1860s. They tried to destroy this country; 682,000 people died. People are talking like this is some cultural thing. This is not a cultural thing. These people had a standing army against this Union. How often do you intend to return to Memphis? I'm only coming as needed and when asked. But I'm prepared to come as often as possible, as often as necessary. Do you think other public figures besides the ones here today will ever join you? I think in the course of time that they will, which is why I'm not getting into calling names. I'll certainly answer some of the misstatements I've heard them say, but I think when they see the turnout - you had 200 people here today - this was certainly a lot more than they predicted would come or thought would come. Or when they see their constituents moving that way. Politicians have a way of finding where the voters are. What do you think when Mayor Herenton called you a "hell-raiser" and "troublemaker" and stated that it was he who had power in Memphis, not you? You know, it's funny. I've been here before, and he welcomed me to City Hall. So I don't know why all of a sudden I'm a bad guy 'cause I don't like a dead Confederate. He didn't say that when he had me in his office. Were there white Southerners from the Civil War era that are worthy of respect? Absolutely. You have any number of former senators, governors, writers - Harriet Beecher Stowe - many of whom were worthy. Some might have even been anti-black. But to lead an army against the country and be honored in that country! I'm not just talking about racists. I'm talking about people that led a standing military against the United States; they should never be honored in that country. That man [Forrest] wasn't a politician. He was a rebel leader of a military army. Why would the United States allow him to be honored here? Andrew Johnson, who was a senator from Tennessee and became vice president in Lincoln's second term, used the "n" word in his acceptance speech. But he was a vice president. I would disagree with him. I would say he probably had racist attitudes, but I would not say he shouldn't be honored. I'm saying how do you honor traitors to the country and use public funds to do it? How national could this situation become? Could it reach the level of President Bush? Clearly, as this picks up steam, it could end up at the president's door - and [Senate majority leader] Frist's door.